Looking for an extra strong top saddle combo for your gate? Our top saddle and backing plate kit is a durable and easy to use combination. Our patent protected design combines a backing plate and saddle attachment into a single piece. The kit also includes the saddle and bolts you'll need to get your gate hung. Looking for a heavy duty gate fitting? We have come up with a unique, patent protected design that combines a backing plate with a saddle attachment. This combination results in an extreme strong top hinge set. 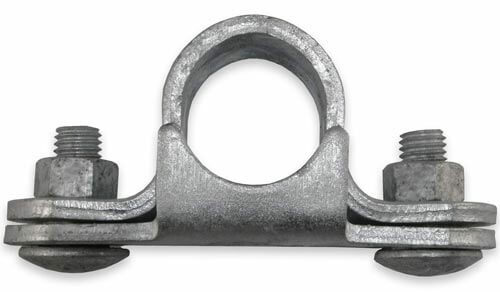 It can be screwed on, or welded on, allowing you to easily fasten the top of your gate and swing it smoothly. Each piece is hot dipped galvanised to fight against corrosion. Paired with one of our bottom gudgeons, it will give you an extremely strong and long lasting product. Measure out where you need the top saddle to be to hinge the top of your gate. Fit the two cup head bolts into the backing plate. This will make future steps a lot easier. Position the backing plate to the wall or post​. 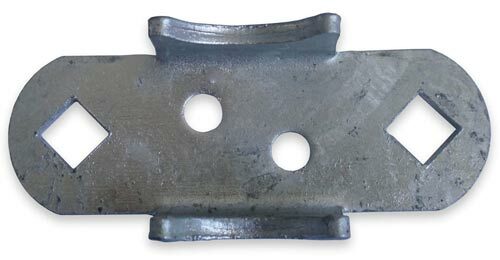 Weld-on or screw-on the plate. Grab your gate and push it into the saddle attachment on the backing plate. Put the top saddle over the top of the gate, lining it up with the bolts. Push the top saddle on and hand tighten the nuts. Once the gate is in the desired position, tighten down the nuts with a spanner. Congratulations! You now have a strong and smooth swing gate.